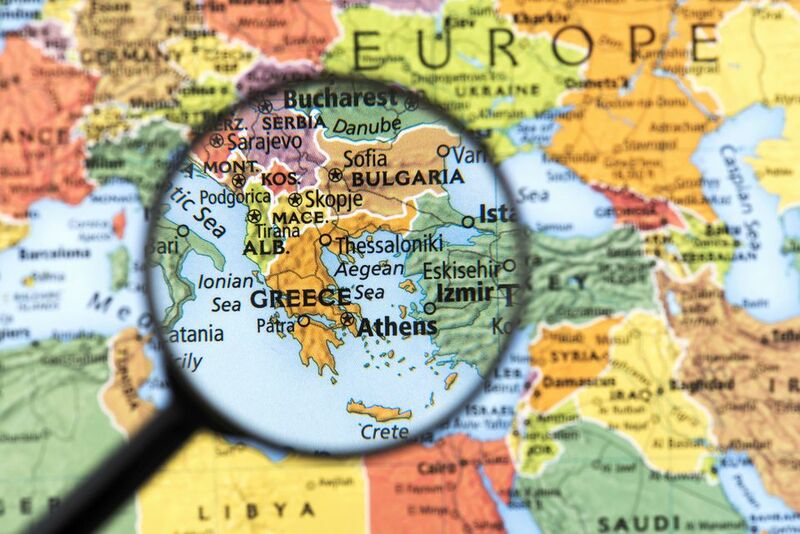 Greece is a nation in Europe and it is considered to be part of "Western" Europe, though, going strictly by the map, it would normally be assigned to southern or southeastern Europe and be part of the Balkan nations. To the north, Greece is bordered by Albania, FYROM/Macedonia, and Bulgaria. In the northeast, Greece shares a border with Turkey. Turkey also is just across the water for many Greek islands; in many cases, these islands are closer to Turkey than to Greece. To the south of the big Greek island of Crete, separated by a long stretch of the Libyan Sea, lies Libya and Egypt, both a couple of days away by ship. The following distances from Greece are from Athens unless otherwise noted. Different locations in Greece will naturally give different results. The island nation of Cyprus is not a part of Greece, though much of it is culturally Greek. Its position in the far east of the Mediterranean puts it a bit closer to some Middle Eastern hot spots. Alexander the Great may have once conquered parts of Afghanistan, but modern day Greece is far away from the mountainous nation. Athens is about 2,525 miles from Kabul, which is the capital of Afghanistan. Greece is far to the southwest of Crimea and the rest of Ukraine. The main city of Crimea, Simferopol, is 722 miles away. Kiev, the capital of Ukraine, is 926 miles away from Athens. Greece is separated from Egypt by the Mediterranean Sea. Cairo is just less than 700 miles away from Athens. The Gaza Strip area is between Egypt and Israel. It's about 750 miles from Athens. Greece is not close to Iran. More than 1,500 miles separate Athens and Tehran. Greece is far from Iraq. While Turkey, across the Aegean to the East, shares a border with Northern Iraq, Greece is well insulated by distance. Athens is about 1,203 miles from Baghdad. Athens is about 746 miles from Tel Aviv at just less than 780 miles to Jerusalem. Greece is not close to Lebanon. Athens is about 718 miles away from Beirut. Greece is separated from Libya by the Mediterranean Sea. Greece's southernmost point, the island of Gavdos, is about 170 miles from Tobruk, which is a city on the northern coast of Libya. The portion of the Mediterranean Sea above Libya is called by geographic convention the Libyan Sea and this stretch of water washes against Crete, Gavdos, and Gavdoupoula, but none of these islands are close to Libya. When the conflicts in Libya were shown on television, maps of the northern coast of Libya sometimes included the island of Crete up in the far right-hand corner. Greek ships from Crete were used to ferry out thousands of Chinese workers, who were taken to Crete and then assisted to return to China; this effort further solidified ties between Greece and China. Athens is about 768 miles away from Syria. Some islands are somewhat closer, but Greece is not close to Syria. 567 miles from Nicosia, Cyprus. 646 miles from Rome, Italy. 1,303 miles from Paris, France. 1,486 miles from London, England. 3,110 miles from New Delhi, India. 4,741 miles from Beijing, China. 4,934 miles from New York City, New York. 5,919 miles from Tokyo, Japan. 5,989 miles from Rio de Janeiro, Brazil. 6,907 miles from Los Angeles, California. 9,528 miles from Sydney, Australia. Cyprus is sometimes mistakenly believed to be a Greek island and part of Greece. While this divided nation is generally considered to be culturally Greek, it is independent. The island is divided into an occupied Turkish area in the north and the Greek-speaking area in the south. Cyprus is located in the Eastern Mediterranean, and so it sometimes is used as a waystation for evacuations from Middle Eastern nations, which puts it into the news in connection with those conflicts.